post offices. Use of this program reduces the time required to process directory mail. All Navy post offices, mailrooms, mail centers, and other locations that process personal mail for assigned personnel are required to use this program. Commands that are still using the card file system should transition to the automated system. This program can be downloaded from the NAVSUP website. To access the program, double click on Corporate Services, then (05) Support Services, then (54) Navy Postal. 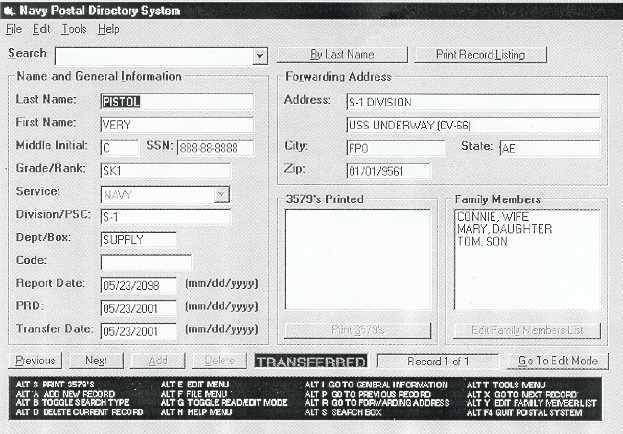 The directory service program can be located under Programs. The system operates in Windows 3.1, WIN 95, WIN 98, and Windows NT systems. PROCESSING DIRECTORY MAIL Directory mail is mail that cannot be delivered as addressed because it bears an incomplete or incorrect mailing address. Mail may be undeliverable, temporarily or permanently, for any number of reasons. It may be incorrectly addressed, the addressee may have transferred, or the mail may be unclaimed or refused. Mail received at your MPO or unit mailroom for personnel having forwarding addresses on file presents no great problem. The mail is suitably endorsed and promptly forwarded, according to procedures described later in this chapter. Mail that is undeliverable because it bears an incomplete or an incorrect address is processed against the directory cards. If an individuals correct address can be determined the mail is delivered. Otherwise it is returned to sender endorsed ATTEMPTED NOT KNOWN. Sometimes it may be difficult to find the proper directory card for a piece of undeliverable mail. This is often because of carelessly written addresses, which are easily misread. The following letters of the alphabet most frequently cause trouble: a and o; h and k; i and e; n and r; n and u. Suppose you are unable to find the directory card for Douglas, Thomas. You might also check under Thomas, Douglas (in the event that the names might have been transposed); or check Douglas, Tom or Tommy (in the event that a nickname is used instead of the proper first name). Also be alert for names ending with the letter e, such as Browne, Harte, or Thorne, in 11-5 AOf1105 Figure 11-5.An example of an automated record for a person transferred.